If you’re like most gardeners, summer isn’t officially here until you start harvesting crisp cucumbers to slice up for your salads and sandwiches. Or maybe you love to grow the smaller, bumpy variety that needs to be blanched and pickled to bring out their best flavor. Either way, you’ll put plenty of hard work into growing them—preparing the soil, weeding, and regular watering—so you don’t want to waste it by timing your harvest incorrectly. Cucumbers need a long growing period, and they’ll be ready to pick in fifty to seventy days. If you harvest them at the right time, which is around 8-10 days after the first female flowers open, you will be rewarded with the sweetest tasting fruit. When you are planting your cucumbers, be sure to read the seed packet. It will give you the length of the mature fruit and also the number of days you should be able to harvest after germination. Remember, most varieties are ready to pick 8-10 days after the female flowers (the ones with the miniature cucumber beneath the flower) have opened. Softly squeeze the cucumber. It should feel firm to the touch. Also, the color should be medium to dark green. Some varieties might be yellowish or white. Again, check the seed packet to be certain. 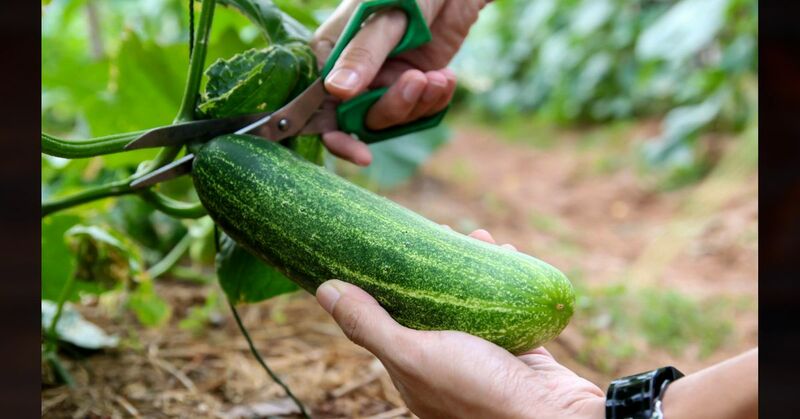 Always use garden pruners or a knife to harvest your ripe cucumbers. Don’t bend and rip them from the vine. Leave about one inch of the stem attached to keep the ends from rooting inside the storage space. Don’t let your cucumbers become overripe. If you leave them on the vine too long, they will develop a harsh, bitter taste. Cucumbers become fully matured at different times on the vine, so it’s important to harvest them as they're ready. It’s best to harvest early in the morning while the vines are still cool. If you pick the cucumbers as soon as they’re ready, you’re encouraging the plant to produce longer into the season. Check the vines daily once they start producing. Cucumbers grow quickly, and in the peak growing season you may be harvesting every other day.